The human and environmental challenges we face today related to sustainability and climate change are enormous in scale – stretching across populations and geographic regions. To address them, we must develop concrete solutions with greater impact and reach. Our model for action at MITOS recognizes the enormity and scale of these challenges, ranging from complex transportation needs to a future with warmer temperatures. Through close collaboration with our partners, we hope to transform our campus into an accessible, interactive test bed for new ideas and solutions, starting at the individual level. The campus - and its many, interconnected systems - become a model and learning tool with widening circles of impact. We start with the individual to find solutions at the campus level to serve both the institution’s needs as well as to incubate new and big ideas. 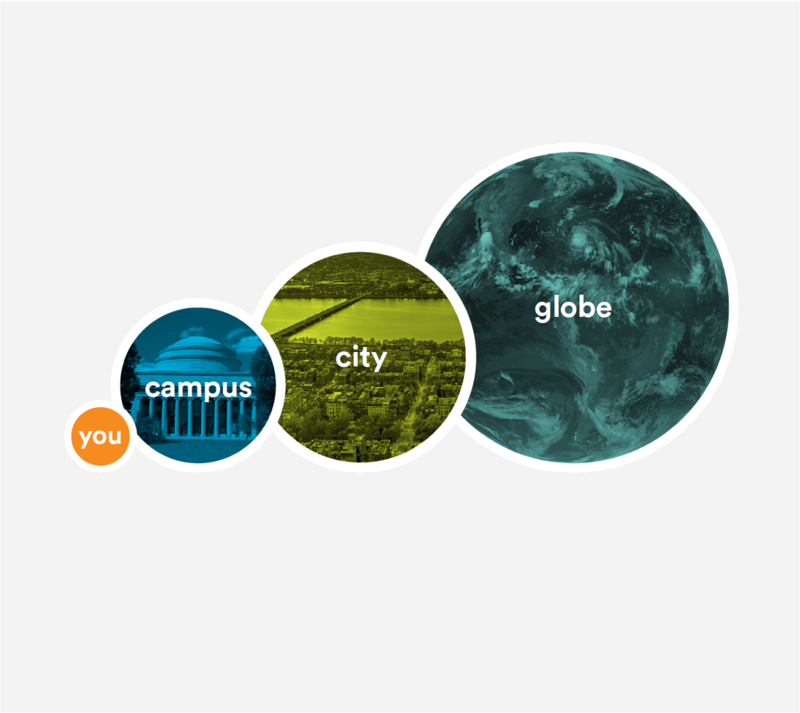 We have have set out to build the internal capacity of the campus community to problem-solve, lead, and define and meet our local sustainability objectives, with an eye toward greater impact. We ask individuals to join us in reimagining systems on campus that can advance the well-being and resilience of people and the environment. AT MITOS, we recognize the deep interconnectivity between our urban campus and the city and seek to operate at both scales. We actively seek solutions to common challenges with the cities of Cambridge, Boston and beyond. By using the campus as a test bed and thinking of MIT itself as a mini city, we hope to share lessons and solutions for a rapidly urbanizing world. We work to make structures, processes, and solutions developed at MIT accessible for reapplication and scaling across the globe.